Delta Hospital has just received three small electric children’s cars for their pediatric unit. 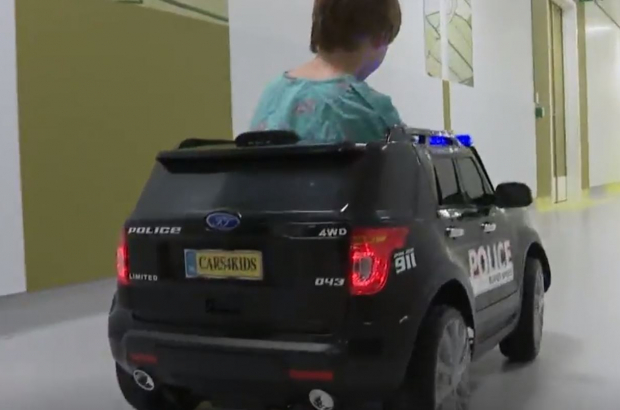 Children will be able to drive into the operating room or treatment in their very own police car. The vehicles were a donation from the organisation "Ce Soir, c'est Noël”. They give children a small piece of their autonomy back. Arriving at the operating room in an electric car rather than on a hospital bed distracts the child from the seriousness of the event. It also helps lessen the anxiety in both the child and the parent, explains Laurence Goffin, a pediatrician at Chirec. The first patient to get to try out the cars was a little boy named Luca. As soon as he got to use the car, he became relaxed and began smiling. Luca’s mother said she was relieved that they were able to calm his stress without the use of drugs. He was crying when he arrived at the hospital, but smiling when he got to the operating room, she said. Avoiding drugs is not the only benefit of the cars. Reducing preoperative anxiety reduces postoperative pain, specialists say. Other hospitals have also begun using this method, such as Braine-L’Alleud, Ath, Arlon and Marche-en-Famenne.